of the Maggie Law Lifeboat? in Gourdon, near Stonehaven, Aberdeenshire! If you are interested in maritime heritage you will be amazed at what's on display at the Maggie Law Maritime Museum in William Street, Gourdon DD10 0LW. This is an old two-storey coastguard building, which sits beside the old harbour and slipway (the Gutty) in the centre of Gourdon. The Maggie Law was one of the first inshore lifeboats, built in 1890 and rowed by six men she was in service for 40 years and saved 36 lives. The severe loss of life by the fishermen of Gourdon, before Todhead Lighthouse was built, meant that this wild and rocky coast claimed many lives, often wiping out three generations of one family in a single tragedy. The fishermen of Gourdon took it upon themselves to provide their own solution, and paid a penny in the pound from their catches, to build and maintain an inshore surf boat that would ride the foam, and save fishermen’s lives. James (Jeems) Mowat, built the boat which was launched in 1890, and named after the daughter of a local fish curer called Tom Law. It is interesting to note that the challenges which are faced in the North Sea today, were being met in the worst of conditions by six local fishermen, putting their own lives at risk, for the safety of their fellow fishermen and families. This is what makes this piece of maritime heritage unique, and worthwhile saving as a valued piece of community heritage. 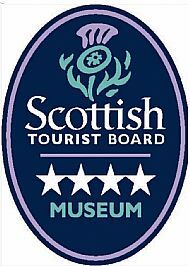 The museum opened on Friday 12th April 2013 and achieved Four Star status in December 2015. In April 2016 the Maggie Law Museum committee, led by Chair Marie Carnie, successfully applied for incorporation as a Scottish Charities Incorporated Organisation (SCIO). The Office of the Scottish Charities Regulator (OSCR) confirmed that the operation of the museum met the charity test and all legal requirements for the award of SCIO status. This means that the Maggie Law Maritime Museum is now an incorporated body having charitable status under the Charities and Trustee Investment (Scotland) Act 2005. 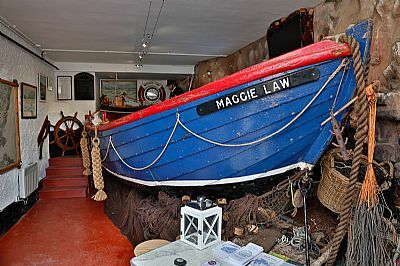 Make a point of visiting the Maggie Law Maritime Museum when visting Aberdeenshire or Angus. If you are unable to visit in person, have a look at our Armchair Tour and send us feedback.